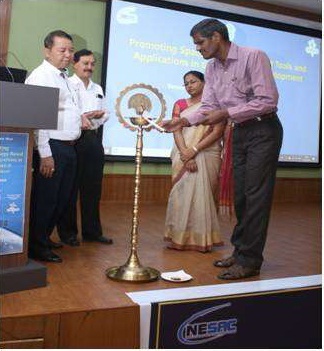 State Meet on "Promoting Space Technology based Tools and Applications in Governance & Development" was organised by Manipur State Remote Sensing Centre (MARSAC) and North Eastern Space Applications Centre (NE-SAC), ISRO on March 23, 2018 at Imphal, Manipur. 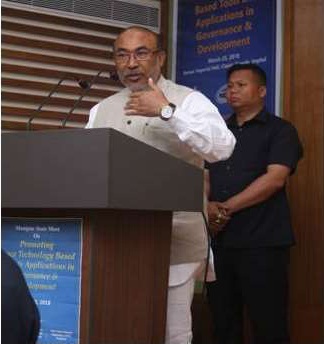 This State Meet is a sequel to the National Meet organised by the Department of Space, Government of India at New Delhi in September 2015 in which Hon’ble Prime Minister in his address emphasised the need to have such meets with various stakeholders at the State level to promote more effective utilisation of space technology for societal benefits. The state of Manipur with a geographical area of 22,327 km2 has a population of 28.5 lakh. The State is endowed with rich natural resources such as large area under forest cover (17,145 km2) numerous freshwater wetlands (636.16 km2) and about 239.43 km2 under agriculture. With increasing pressure on the natural resources and the changing landuse in the hills, the valley area of the state faces annual floods and landslides during the monsoons. Thus, it is imperative to monitor the natural resources and land use changes in the catchments of major rivers and also alerts the concerned departments with early warnings for events which may cause floods. Keeping these points into consideration, State Meet was organised for effective utilisation of space technology in Manipur State. Total 84 delegates from 17 departments representing different fields of expertise, participated in the State Meet. Out of these, six departments were new to the field of Space technology, where as, 11 departments were already implementing space technology. The Meet was inaugurated by the Chief Guest, Ms. Nidhi Kesarwani, IAS, Secretary (Science &Technology), Government of Manipur. She highlighted the importance of space technology and its use for large number of line departments. She insisted that all the concerned departments have to take initiatives and use it for various developments and management of resources, Dr. N. Randhir Singh, Director, MARSAC, pointed out the role of MARSAC in carrying out projects for the benefit of the Manipur state. Shri PLN Raju, Director, NE-SAC in his opening remarks highlighted their support to MARSAC in upgrading the infrastructure, software tools and facilitating to take up projects that are the need of the hour. He gave a brief history of Indian space program, stating the importance of space technology in the current scenario. Shri K R Manjunath, Scientist, ISRO HQ, delivered a presentation on the topic of the workshop and briefed about the genesis of the State Meet and its importance. He also stressed the effective use of space technology and concluded his presentation by shedding light on the road map of space infrastructure. There were two technical sessions where all the 17 User Departments made presentations apart from the lead talk by eminent scientist of ISRO. The User Departments made their proposal for the project during the presentations. 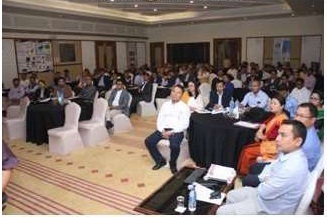 The technical sessions were followed by interaction with officials from ISRO, NE-SAC, NRSC and MARSAC along with representatives from other line departments. A brief demonstration of "Bhuvan & its services" and "North Eastern District Resource Planning (NEDRP) & its services" were arranged by NRSC and NESAC respectively. An Exhibition was also organised as a part of the State Meet, demonstrating application of space technology across varied fields ranging from natural resource management, sericulture and horticulture suitability mapping, disaster management support, UAV applications, SATCOM applications etc., High resolution images of part of Imphal, Manipur from Cartosat-2 Series Satellite were also displayed. Videos on Indian space program along with 3D fly-through were also exhibited. The workshop concluded in the presence of Shri. N Biren Singh, Hon’ble Chief Minister, Manipur and Shri Y Joykumar Singh, Hon’ble Deputy Chief Minister as Chief Guest and President of the meet respectively. The State Meet was a platform for release of various literatures. 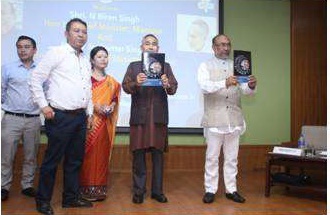 Shri N. Biren Singh and Shri Y. Joykumar Singh, have released the booklet on “Effective use of space technology” in Manipuri script. MARSAC has brought out an information tablet containing details of technical program, some of space based projects being carried out and flyers prepared by ISRO, DOS. In addition NE-SAC circulated useful information on space technology to all the delegates of State Meet. Space technology has a huge scope for line departments. The 17 line departments have proposed many projects with utilisation of space technology (30 potential areas). Participated user departments have undertaken more than 13 projects focusing on space technology. The projects currently being executed in the line departments address varied range of space technology based applications ranging from mapping of water bodies, forest working plans, geo-tagging assets, horticulture potential area mapping to satellite communication as well as UAV based surveys. This Manipur State Meet was the 17th such state meet. With this, 17 States (Haryana, Bihar, Uttarakhand, Mizoram, Nagaland, Rajasthan, Punjab, Jharkhand, Meghalaya, Himachal Pradesh, Kerala, Chhattisgarh, Assam, Madhya Pradesh, Tamil Nadu, Uttar Pradesh and Manipur) have conducted their Meet so far, which were attended by Senior dignitaries of the state like Chief Ministers and senior officials of the State etc., Remaining States have worked out the plans to conduct such Meets and get the benefits of Space Technology in Governance and Development.